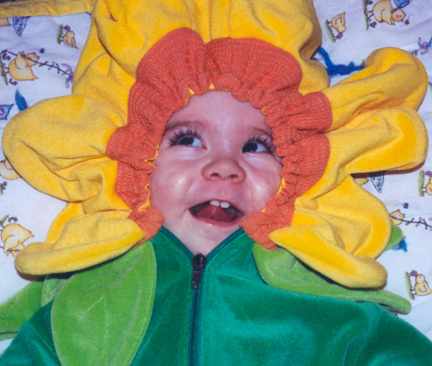 Madison Claire Millington was born on May 16, 2002 and passed away in her mommy’s arms on August 17, 2004 due to complications from Spinal Muscular Atrophy (SMA). Madison taught her family so much about love and offered so many gifts in her two brief years of joyous life. With an ever present smile on her face – she was truly an angel in every sense of the word. Madison’s favorite things were taking baths, going for walks, watching movies, watching birds and her ‘kitty.’ Along the journey with Madison, her family faced the most difficult decisions parents could make, but as long as Madison was smiling they knew were doing the right thing. Madison was born on May 16, 2002, three weeks early but overall very healthy. She was a content, happy baby from the beginning; it was rare to hear her cry. Over the next few months, we noticed she was not progressing as our other two children had developed – Madison was not lifting her head, rolling, bearing weight on her legs or sitting unaided. In November of 2002, we brought our concerns to her pediatrician during a routine six-month well check and she referred us to a neurologist. After examining Madison, the neurologist determined she suffered from SMA and ordered blood work to confirm her diagnosis. The doctor told us very little about SMA at that first meeting. She left us with this: if the tests came back positive, Madison would have a very short life expectancy. Our daily life was now measured in moments. The challenges of life with a disability can feel overwhelming at times. As a family, we were not prepared for the challenges of life with a terminally-ill child. Add to that, the routines of life with two very young, very healthy children – Harrison, then age 5, and Grace, then age 3. Two years can feel like forever when they are filled with seemingly endless days and nights in the hospital. When we were not at the hospital – a room overflowing with medical and nursing care equipment occupied our house, all before Madison’s first birthday. The cliché ‘children are quick to bounce back’ refers to a child’s resilience – the ability to cope within a stressful situation. Madison broke the mold for resilience. As her body wore out – her spine greatly curved and it became more difficult to move her legs, arms and head. She figured out that if she bit her finger, she could pull her head to the other side – self-determination on display. By her second birthday, Madison had defied all odds. Even with the torture her body was suffering, her bright personality and quick smile pulled the rest of us through day by day. Madison passed away on August 17, 2004, at six o’clock in the morning cuddled in my arms, surrounded by her family and shrouded in love and peace. When a child dies – even though you know they have been relieved of their physical pain – your own grief, the acute pain you feel in your own heart, kicks in. You reflect on the ‘journey’ – two short years. You remember the smiles, the giggles and the cuddling. Our lives were made better through Madison’s presence. And we hope to make the lives of other children and their families even slightly better through the work of the Foundation named in her honor. Dana Millington is the mother of Harrison, Grace, Madison, and Emerson Millington. Her appreciation for the indelible impression of a child’s life, and death, has been a driving force in the development, fundraising, and installation of Madison’s Place playground.